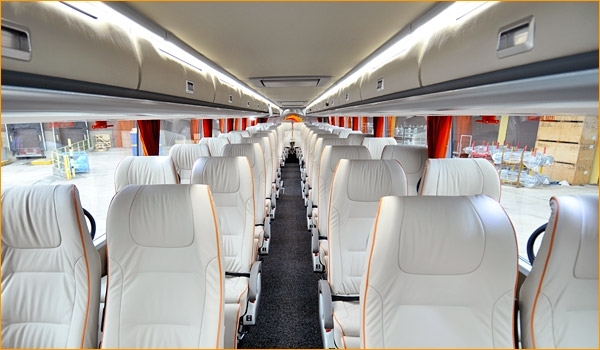 More frequency or bigger buses for long-haul commuters? Route 72X and other commuter buses are packed, and their ridership is rising. With tolls set to rise on the Golden Gate Bridge, the problem could get even worse. While a good thing, Golden Gate Transit (GGT) needs to figure out how to deal with the rising tide. GGT has two ways to accommodate excess ridership: increase the bus frequency or increase the bus size. Frequency is freedom. Rather than spacing buses to come every 30 minutes, GGT might space them every 15, or 7, or 3. This reduces the penalty for missing your bus, as there will be another one coming soon. The upside is that this can induce demand, especially if development and transportation policies at either end of the line encourage transit use. More trips are viable by this bus, as riders have more flexibility to schedule their trips. Casual riders, if the bus comes frequently enough, won’t need to check a schedule at all. For a commuter line, the rider just needs to know that buses leave between, say, 5am and 9:30am. Any more detail is unnecessary. The downside is that frequency, especially on commuter lines, is expensive. 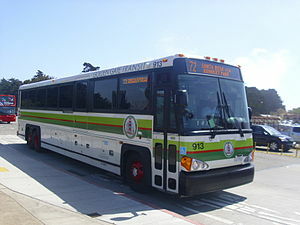 GGT pays its drivers full-time, and a number of the buses deadhead (run Not In Service) up to Santa Rosa or San Rafael after their commute runs. Improved frequency will mean more drivers and likely more deadheading. This added burden may be beyond GGT’s capability to deliver. Increasing frequency on round-trip Basic services, such as the 101, or turning deadhead runs into northbound commuter service would allow fares to recoup the costs. Interior of the Astromega. Image from Van Hool. While it doesn’t induce demand in the same way a more-frequent route may, a larger bus will accommodate the extra ridership without adding significantly to operating costs. Other bus systems use extra-long buses to meet demand, but these would be difficult to navigate around downtown San Francisco and tend to be too utilitarian for commuters’ taste. A better method would be to use double-decker buses similar to those used by Megabus and Google (like the Van Hool TDX27 Astromega). They have rear storage capacity for 8 bicycles (Google runs with rack space for another 4 on the rear), enough seating for 91 passengers, and aren’t significantly taller or longer than the MCI buses currently in use by GGT. And, unlike the MCI buses, these have rear doors. Currently, all GGT buses offload and load at the front door, reducing the rear doors to vestigial afterthoughts. The delay of boarding passengers waiting others getting off adds to operating expenses and trip time. With larger buses, this effect is exaggerated. If GGT got its act together and allowed passengers to get off the bus at the rear doors, a rear door on large-capacity GGT commuter buses would save the agency quite a bit on already expensive routes. Allowing commuters to board at the rear would save even more time and money. Double-deckers wouldn’t be unprecedented in the Bay Area. The Google Shuttle is a great success. They navigate San Francisco’s streets with relative ease and provide a comfortable way for their workers to get to Silicon Valley. Whether with bigger buses, or with greater frequency, GGT will need to address its crowding. At least internally, it start to consider the costs and trade-offs to each approach.